The Texas portion of the Gulf Intracoastal Waterway (GIWW/GICW) has its start at 30°03.2’ N / 93°43.2’ W (MM 266.0 WHL) on the Sabine River which divides Texas from Louisiana. From the Sabine River, the Texas GIWW runs for 415.5 miles starting out in a generally southwesterly direction before gradually turning to the south near Aransas, TX before ending in Brownsville, TX at 25°57.1’ N / 97°24.1’ W (MM "681.5 WHL") very near the Texas / Mexico border. The Texas Gulf Intracoastal Waterway is marked with your standard Aids to Navigation which also display yellow triangles or yellow squares. When southwest and south bound along the Texas GICW, marks displaying yellow triangles should be kept on your starboard hand and those marked with yellow squares should be kept to port. While typically the yellow triangles will be found on red markers and yellow squares are found on green markers, caution should be exercised along this route in the vicinity of the Sabine River, Galveston Bay, Chocolate Bay, Port O’Conner, Victoria Barge Canal, and Port Isabel where the GIWW intersects or coincides with the channels marked by the Lateral Buoyage System. Chart #11331 covers the GIWW from Ellender, LA at (MM "243.6 WHL") to Galveston Bay at (MM "350.2 WHL"). Chart #11324 covers the GIWW from Galveston Bay Entrance at (MM "350.2 WHL") to West Bay at (MM "359.9 WHL"). Chart ##11322 covers the GIWW from Galveston Bay at (MM "359.9 WHL") to Cedar Lakes at (MM "409.2 WHL"). Chart ##11319 covers the GIWW from Cedar Lakes at (MM "409.2 WHL") to Espiritu Santo Bay at (MM "479.5 WHL"). Chart #11315 covers the GIWW from Espiritu Santo Bay at (MM "479.5 WHL") to Carlos Bay at (MM "510.5 WHL"). Chart #11314 covers the GIWW from Carlos Bay at (MM "510.5 WHL") to Redfish Bay at (MM "535.5 WHL"). Chart 11308 covers the GIWW from Redfish Bay at (MM "535.5 WHL") to Laguna Madre at (MM "587.3 WHL"). Chart 11306 covers covers the GIWW from Laguna Madre at (MM "535.5 WHL") to Chubby Island at (MM "635.1 WHL"). Chart 11303 covers the GIWW from Chubby Island at (MM "635.1 WHL") to Stover Point at (MM "656.9 WHL"). Chart 11302 covers the GIWW from Stover Point at (MM "656.9 WHL") to Port of Brownsville at (MM "681.5 WHL"). All distances along the Texas Gulf Intracoastal Waterway are given in statute miles unless otherwise noted. 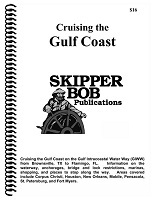 Statute miles are used in order to conform to the distances shown on the small craft charts typically used along this route. This portion of the GIWW between the Louisiana State line and the Mexican border is measured based on increasing mileage West of Harvey Lock from (MM “266.0 WHL”) to (MM "681.5 WHL"). The Federal project depth for the Texas portion of the Gulf Intracoastal Waterway provides for a minimum channel depth of 12 feet. Even though every effort is made to maintain the project depth, the actual controlling depths in the channels may vary due to shoaling reducing the available water depth until maintenance dredging can be accomplished. All operating bridges and locks in Texas guard VHF Channel 13. The U.S. Coast Guard advises all vessels to exercise caution in any area where the GIWW intersects major shipping channels. A “Security Call” on VHF channel 13 is requested prior to crossing any shipping channels, especially during periods of restricted visibility. A total of 13 bridges cross the Gulf Intracoastal Waterway in the state of Texas. The fixed bridges (10), all have vertical clearances of 73’ or better with the exception of the "State Road 361 Bridge" in Aransas Pass, TX having a clearance of only 48’. An alternate channel does exist that allows this bridge to be bypassed if necessary. The (3) operating bridges all have closed vertical clearances between 0’ and 8’ that will prohibit most vessels from passing through without an opening. All guard VHF Channel 13. The table above lists the bridges, their schedules, and restrictions along the Texas Gulf Intracoastal Waterway from the Sabine River in Texas southwest to the Mexican Border. Tidal ranges are fairly small along the Texas coast. Under normal conditions the mean range of tide averages about less than 1.5’ at Sabine Pass to about 0.5’ at Port O’Conner and across the remainder of the state to Port Isabel. Texas typically experiences a "Mixed Tide" - exhibiting (2) unequal high and low tides each day. There are more than (10) Passes (Inlets) between the Gulf of Mexico and the inside waters of Texas. Many of these are only suitable for shallow draft vessels or local knowledge, but some can be considered navigable by most vessels. Sabine Pass lies on the Texas/Louisiana border about 224 NM west of the approach to Southwest Pass and 50 miles ENE of Galveston Entrance. It provides access to the GIWW, Port Arthur, Port Neches, and Beaumont, TX. NOAA Chart #11341 - Calcasieu Pass to Sabine Bay is suggested for the approach to Port Arthur while NOAA Chart #11342 - Sabine Pass and Lake is suggested for the entrance. The approach is marked by buoy (RW "SB&qot; Mo (A) located at 29°25’01"N., 93°40’01"W). It is well-marked with lighted buoys and ranges and provides a minimum depth of 37.8 feet mid-channel. Prominent on the approach is Sabine Bank Light (Q 30ft 5M) and the Sabine Pass East Jetty Light (Iso 2s 42ft 8M located at 29°38’41"N / 93°49’22W). The entrance is protected by jetties to the east and west extending over 2.2 NM into the gulf from the shoreline. It is deep and well-marked with lighted buoys, lighted beacons, and range lights. The depths in the channel may be reduced as much as 3 feet during northers. The Gulf Intracoastal Waterway is intersected 13.7 NM above the entrance at (MM "288.6 WHL"). Dangers – Offshore oil well structures, Sabine Bank, and the spoil and dumping grounds on either side of the entrance channel. A strong westerly current known to cause groundings after tropical cyclones was reported between Sabine Bank Channel Lighted Buoys 17 and 18, and between Sabine Bank Channel Lighted Buoys 33 and 34; extreme caution is advised. Tides and Currents – The range of tide at the entrance to Sabine Pass is 2.5 feet. The currents off the entrance of Sabine Pass are dependent upon the direction and velocity of the wind. The tidal current between the jetties at averages 1.1 knots on the flood and 1.6 knots on the ebb, but velocities up to 2.5 knots have been observed in Sabine Pass. Rollover Pass is an inlet from the Gulf of Mexico into East Bay and lies 15.6 NM NNE of the Galveston Entrance Approach Buoy. The inlet is not navigable for even the smallest of vessels due to strong tidal currents, obstructions, and a shifting bottom. Galveston Entrance is wide (1.3 NM) well-marked with lighted buoys and ranges with jetties protecting both sides of the entrance. The entrance opens into Bolivar Roads a large deep water area in the entrance between Bolivar Peninsula to the north and Galveston Island to the south. NOAA Chart #11332 - Sabine Bank is suggested for the approach to Galveston while NOAA Chart #11324 - Galveston Bay Entrance is suggested for the entrance. The approach to Galveston is marked by lighted buoy RW "GA" Mo (A) at 17.1 NM from the end of the jetties and lighted buoy RW "GB" Mo (A) is at 9.2 NM. Prominent features on approaching Galveston Entrance include a 363’ building south of the entrance on Galveston Island and an abandoned lighthouse on the north side of the entrance. North Jetty Light (Iso R 6s) and South Jetty Light (Iso G 6s) displayed on 30’ towers mark the entrance. The Gulf Intracoastal Waterway intersects at 7.7 miles above the entrance at (MM “350.8 WHL”). An alternate GICW channel also intersects 5.3 miles above the entrance at (MM “352.3A WHL”). Brazos Harbor Entrance is the entry point for the town of Freeport, TX, known locally as Brazosport. The entrance is well marked with lighted buoys and lighted ranges. The approach to the entrance is marked with a lighted buoy RW “FP” Mo (A). The entrance is deep with a least depth of 45 feet available to the Upper Turning Basin. Brazos Harbor Entrance intersects the GICW about 1.5 miles above the entrance near (MM “395.0 WHL”). NOAA Chart #11321 - San Luis Pass to Matagorda Bay is suggested for the approach to Freeport while NOAA Chart #11322 - Galveston Bay to Cedar Lakes is suggested for the entrance. Matagorda Bay Entrance lies 63 NM SW of Brazos Harbor Entrance. It leads to Port Lavaca and Point Comfort about 21 NM above the entrance. The entrance is deep with a least project depth of 36 feet found as far as Point Comfort, has jetties on both sides of the entrance, and is well-marked with lighted buoys and ranges. NOAA Chart #11316 - Matagorda Bay and Approaches is suggested for the approach to Port O’Connor while NOAA Chart #11317 - Matagorda Bay is suggested for the entrance. The approach is marked by RW ”MSC” Mo (A) approximately 18 NM SE of the entrance and by RW ”MB” Mo (A) lighted buoy lying about 2.6 NM SE of the entrance. Matagorda Bay Entrance Light (28°25'18''N., 96°19'06''W. ), 64 feet above the water, is shown from the E jetty. at the entrance to Matagorda Bay. Strong current flows (8+ knots) can be found at the peak of the flood or ebb currents in the entrance and large whirlpools have been documented at the channel width transition points of the channel. The GIWW intersects the Matagorda Shipping Channel 5.2 miles above the entrance near (MM "471.1 WHL"). Pass Cavallo an entrance to Matagorda Bay from the Gulf, is about 0.35 mile wide between Matagorda Island and Matagorda Peninsula. The pass is obstructed by a bar that is subject to frequent changes in location and depths. The depths vary from 3 to 8 feet. When a sea or swell is running outside, there is virtually a continuous line of breakers across the bar. The pass is subject to swift currents and is not considered navigable. It is used only by a few local vessels that draw less than 5 feet and have thorough local knowledge. Inside the bar, the channel extends along the E shore to Matagorda Island, passing about 0.5 mile E of Saluria and Big Bayous, and thence off the Port O'Connor jetties into the open waters of the bay. Unmarked shoals lie along the E side of the pass. There is a passage with a depth of 9 feet or more through these shoals in a NE direction, from off Saluria Bayou. This channel is particularly subject to change. Tides and currents - The diurnal range of tide in Pass Cavallo is 1.4 feet. The level of the water surface is largely dependent on the winds, and during strong northers may be depressed 2 feet or more. The tidal current in Pass Cavallo is believed to attain a velocity of 2 knots with currents of 5 knots reported. It is reported to be very strong in the land cut through Matagorda Peninsula, especially on the runoff of the ebb after strong S winds. Aransas Pass is the primary approach from the Gulf of Mexico to Aransas and Corpus Christi TX. The approach to Aransas Pass is marked by buoy RW “AP” Mo (A), 4.8 NM from the entrance. The entrance channel is deep with a project depth of 45 feet to Corpus Christi, it is well marked with lighted and unlighted buoys and daybeacons, and lighted ranges. It is protected by jetties on both sides with San Jose Island to the north of the entrance and Mustang Island to the south. NOAA Chart #11307 - Aransas Pass to Baffin Bay is suggested for the approach to Corpus Christi while NOAA Chart #11309 - Corpus Christi Bay is suggested for the entrance. A lighthouse, 67 feet showing Iso 2s light during the day and Iso 2s G at night high located on Harbor Island will be sighted during your approach to the pass. The first intersection (GICW Alternate Channel) is located 1.6 miles above the entrance at (MM “534.3(A) WHL”). The second intersection (GICW) is 7.7 miles above the entrance at (MM “533.0 WHL”). Port Mansfield Inlet is found 65.8 NM south of Aransas Pass and 30.5 NM north of Brazos Santiago Pass. It allows access to the GIWW and Port Mansfield, TX. NOAA Chart #11304 - Northern Part Laguna Madre is suggested for the approach to Brazos Santiago Pass while NOAA Chart #11306 - Laguna Madre (Middle Ground to Chubby Island) is suggested for the entrance. The approach is unmarked. Vessels should approach Port Mansfield through the Port Mansfield Safety Fairway. The entrance is marked on the seaward ends of the north and south jetties with lighted daybeacons. (Fl R 2.5s 25ft 5M "2") marks the north jetty and (Fl G 2.5s 25ft 5M "3" marks the south jetty. The jetties are reported to be in extremely poor condition. Lighted and unlighted daybeacons and buoys mark the cut along the 8.4 NM dredged channel to Port Mansfield. Controlling depths in the entrance channel are 8 feet mid channel. Due to recent hurricane activity in the Gulf of Mexico resulting in severe shoaling, Port Mansfield Inlet is not recommended without local knowledge. It also intersects the Texas segment of the Gulf Intracoastal Waterway approximately (7.4 NM) miles above the entrance jetties at MM 629.8 WHL. A speed limit of 4 knots is enforced in the harbor. Tides and Currents – Tidal range at the entrance averages about 1.2 feet. Tidal currents typically run directly between the jetties on both the flood and the ebb. Located 6.5 NM north of the Mexican Border and 31.6 NM SSE of Port Mansfield Entrance the Brazos Santiago Pass provides access to the southern tip of South Padre Island, Port Isabel, and intersects the Gulf Intracoastal Waterway at MM "668.0 WHL", 3.5 NM above the entrance, and the port of Brownsville, TX. NOAA Chart #11301 - Laguna Madre is suggested for the approach to Brazos Santiago Pass while NOAA Chart #11302 - Stover Point to Port Brownsville is suggested for the entrance. The approach is marked by a buoy (RW "BS" Mo (A) located at 26°03’56"N / 97°06 rsquo;35"W) lying about 3.5 NM east of the entrance jetties. Prominent on the approach to Brazos Santiago Pass is the radio antenna at South Padre Island Coast Guard Station on the north side of the pass, as well as a water tank near 26°04'15"N / 97°13'10'W) and Port Isabel Light (F 91ft) shown from the white conical brick tower located at (26°04'36"N / 97°12'24'W). Vessels should approach Brazos Santiago Pass through the Brazos Santiago Pass Safety Fairway or the Coastwise Safety Fairway. The entrance has been improved with (2) rubble mound jetties to the north and south, extending nearly 1 mile into the Gulf of Mexico. The entrance is deep and well-marked with lighted buoys and range lights. Depths of up to 36+ feet are available. Brazos Santiago Pass intersects the GICW at (MM “668.4 WHL”) 3.5 NM above the entrance. Dangers – An unmarked dangerous wreck lies 4.5 miles north of Brazos Santiago Pass approach buoy. Tides and Currents – Tidal range at the entrance averages 1.2 feet. Tidal currents of 6 knots have been reported in the vicinity of Brazos Santiago Pass and Port Isabel which may cause strong cross currents on the Intracoastal Waterway at about MM "665.1 WHL", especially with a flood tide and strong southeast winds. Caution is advised for larger vessels transiting between Port Isabel and Long Island.